Naturalized in the US, England, Europe, New Zealand. References cited below are from Belgium and Germany. In California, present in a number of counties along the coast. Monty, A., Eugène M., & Mahy G. (2014). Vegetative Regeneration Capacities of Five Ornamental Plant Invaders After Shredding. Environmental Management. 55, 423–430. Wittig, R. (2012). Frequency of Buddleja davidii Franch. (Buddlejaceae) in Germany along ecological gradients. Flora - Morphology, Distribution, Functional Ecology of Plants. 207, 133–140. It invades much of western Oregon and Washington, in habitats ranging from floodplains to mountain slopes, often in disturbed areas. In California, present in a number of counties along the coast. A note to the Cal-IPC watchlist said it is becoming a problem in riparian areas near Santa Cruz. Considered "alien/established" in areas of Europe that are similar to California, including France, Italy, and Spain. Also in areas of eastern Australia and New Zealand that are similar to California. Oregon State University Extension Service (0). Oregon State University Extension Service. Classified as a B-rated noxious weed by the Oregon Dept of Agriculture, which wants to eradicate it from the wild and has banned most cultivars from sale. It invades much of western Oregon and Washington, in habitats ranging from floodplains to mountain slopes, often in disturbed areas (OR Extension). In New Zealand it is estimated that the weed pest is displacing valued native species and costing the forestry industry $0.5 to 2.9 million annually in control and lost production (USFS). Also a problem in the United Kingdom (Tallent-Halsell 2009). Oregon Dept of Agriculture (2015). Oregon Noxious Weed Profiles. Service, USDA. Forest (2005). Weed of the Week - Butterfly Bush Buddleja davidii Franch..
Tallent-Halsell, N. G., & Watt M. S. (2009). The Invasive Buddleja davidii (Butterfly Bush). Botanical Review. 75, 292–325. Watt, M. S., Kriticos D. J., Potter K. J. B., Manning L. K., Tallent-Halsell N., & Bourdôt G. W. (2010). Using species niche models to inform strategic management of weeds in a changing climate. Biological Invasions. 12, 3711–3725. Classified as a B-rated noxious weed by the Oregon Dept of Agriculture, which wants to eradicate it from the wild and has banned most cultivars from sale. It invades much of western Oregon and Washington, in habitats ranging from floodplains to mountain slopes, often in disturbed areas (OR Extension). In New Zealand it is estimated that the weed pest is displacing valued native species and costing the forestry industry $0.5 to 2.9 million annually in control and lost production. These are areas similar to California's climate. 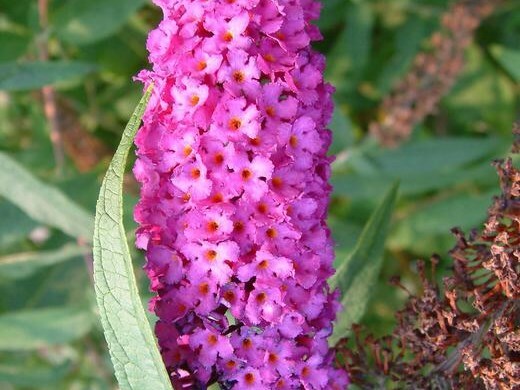 There are 23 other species of Buddleja in Randall 2012 although B. davidii has by far the most number of citations. B. asiatica is an invasive species in Hawaii, where it displaces native species, but that is not similar climate to California (CABI datasheets). B. globosa is in the DAISIE database of invasive species in Europe, present in the United Kingdom and Portugal, but without details on impacts. Randall also has B. globosa cited from invasive lists in Victoria, Australia. B. madagascariensis is listed on the Victoria invasive plants website as displacing native species. Medium confidence because I don't have a lot of details on all of these. This species has a wide ecological range, so while it has invaded many areas that are similar to California, it is also in many areas that are not, such as South America, northern Europe, the eastern US, and southeastern Asia. Forms dense stands in riparian areas, especially those with frequent flooding, as well as disturbed sites such as reforestation areas. It can invade a range of sites including mountain slopes. Can grow 0.5 to 2m in height each year. At one site, plants dumped on a garbage heap grew to 2m and flowered in their first year, then within 4 years the thicket grew to 4m. Roots extend 4m into the soil. The plants generally die after about 20 years but some can grow for 30 years. It can both inhibit and facilitate native plants, depending on the species. It is uncertain whether B. davidii alters the trajectory of plant sucdession. There was no mention of this in references. No mention of toxicity. The usual areas where it invades are riparian or forest gaps, rather than grasslands or other grazing areas. Based on the description of rapid growth and dense thickets in Q7, impenetrable thickets sound possible. B. davidii is a shrub with multiple trunks. "Butterfly bush exhibited a high vegetative regeneration capacity from all types of vegetative parts, be it shredded or not." This experiment used a professional green waste shredder to shred aboveground and belowground plant material. "Do not leave the clippings on the ground, as they can easily take root and create a new plant...Whatever you do, don't dump the clippings along a roadside or along a creek or river, as these are preferred habitats for escaped butterfly bush." "Butterfly bush exhibited a high vegetative regeneration capacity from all types of vegetative parts, be it shredded or not." This experiment used a professional green waste shredder to shred aboveground and belowground plant material. Yes, see details in question 14. Seeds are thread-like and long-winged and contained in a capsule. Yes, but it depends on the cultivar. Oregon is allowing specific sterile cultivars to be sold. "Some cultivars have been found to produce much less seed than others. For example, a study at Longwood Gardens in southern Pennsylvania found large differences in the amount of viable seed produced by B. davidii varieties. For example, cultivars 'Summer Rose' and 'Orchid Beauty' produced 20 times fewer viable seeds than 'Potter's Purple' and 'Border Beauty'. The study also found that a single flower cluster of 'Potter's Purple' was found to produce more than 40,000 seeds." "The flower clusters can be so profuse that they cause the branches to arch even more" (USFS). Plants retain seeds on the plant over the winter and they are released in early spring to summer. In New Zealand, dispersal can start in late autumn or early winter. Seeds are short-lived in the seed bank. This reference did not specifically address germination rate, but given the facts above it sounds like B. davidii does not have specific requirements and does not hold seeds in the seed bank for special conditions. Flowering occurs when the species is two years old, occasionally in the first year. Depending on the location, it flowers from late spring to mid-autumn or from early summer to late summer/early autumn. In the UK, there is a wide variation among locations and individuals in the time of first flowering. Seed formation and ripening occurs within three weeks of flowering. In California, it flowers from March to September. Therefore, seed production for more than three months seems very likely. Wind is the main source of dispersal. Seeds are mostly dispersed by wind but can also be dispersed in water in riparian areas, especially during flooding. In Europe, it became naturalized as it spread along railroad tracks where seeds were either carried on locomotives or blown by the low-pressure drag created by the trains. Cars have also been found to disperse seeds physically. One reference said that the spellings of Buddleja and Buddleia are both accurate.